Monday, August 31, 2015 at 11:48am. Use the entrance on Burnside. "No talks. You may opt to take up to 60 seconds to complain about Big Data. No obligation to read the paper." This month's paper is What’s your ML Test Score? A rubric for ML production systems by Eric Breck, Shanqing Cai, Eric Nielsen, Michael Salib, and D. Sculley. Read it or don't - the goal is just to have something to start conversations. "Did you read the paper?" will do nicely. 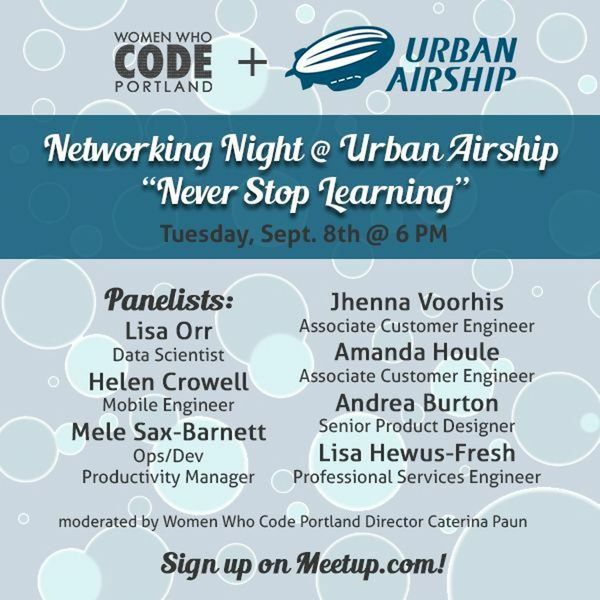 ~ In partnership with Urban Airship and Uncorked Studios, Code Fellows presents ~ Diversity in Tech: How do you do it... and why? At this event, leaders from PDX tech companies that have had success in diversifying their teams will discuss how they've done so and why. They'll talk about where they source candidates, the resulting company culture, and why a diverse team matters to their bottom line. We'll hear from Planet Argon, Uncorked Studios, Free Geek, and Urban Airship. After the discussion, get your elevator pitches ready for Flash Intros! This is where job seekers get two minutes to connect with CTOs and hiring managers from the Portland tech community. Bring resumes and/or business cards. Are you ready to take the next step in your career? Are you wondering how to land your dream job, or even how to start your own business? Maybe you’re a recent grad looking to get your start. Or maybe you’re already an established professional, excited for your next challenge. AMA PDX wants to help you take your career to the next level, whether that be with your current employer, another employer or through entrepreneurship. We’ve recruited a panel of experts on personal branding, networking and the job search process. You’ll want to hear what they have to say about your next career move. This month's paper is Using Psycho-Acoustic Models and Self-Organizing Maps to Create a Hierarchical Structuring of Music by Musical Styles. by Rauber et al. Read it or don't - the goal is just to have something to start conversations. "Did you read the paper?" will do nicely. Hey folks! It’s time again for our monthly meeting. Whether you’re a newcomer to Scala or an experienced expert, we’d love to have you join us. If you have general questions, want to get feedback on your code or get help solving a problem, or if you just want to get input on possible solutions or approaches to help you solve problems, this will be an ideal opportunity to do so. This month we'll have Rob Norris continuing to engage newcomers to Scala with a short, introductory talk and Todd Burnside will talk about ad-hoc polymorphism using typeclasses in Scala.